As I was turning off lights before heading to bed last night, I peeked outside only to discover that is was snowing once again. Already, the ground was covered in white and the wind was blowing so I knew the roads probably weren’t going to be in great shape this morning. As I had predicted, all the schools in the area were closed. Not because of the snow, but because the 2-3″ of snow we got was now being tossed into big drifts from the strong winds. These same winds also brought along wind chill factors that were well below 0 and weather advisories warning every one of the cold temperatures and providing safety information on the importance of not staying outside for extended periods of time. Hubby got up and began getting ready for work, but I convinced him to consider the fact that the roads might not be that safe. He took my advice and worked from home instead. Since we were avoiding any trips out into the cold, it seemed like a good time for a project. So hubby took a mid-morning break and began peeling apples. 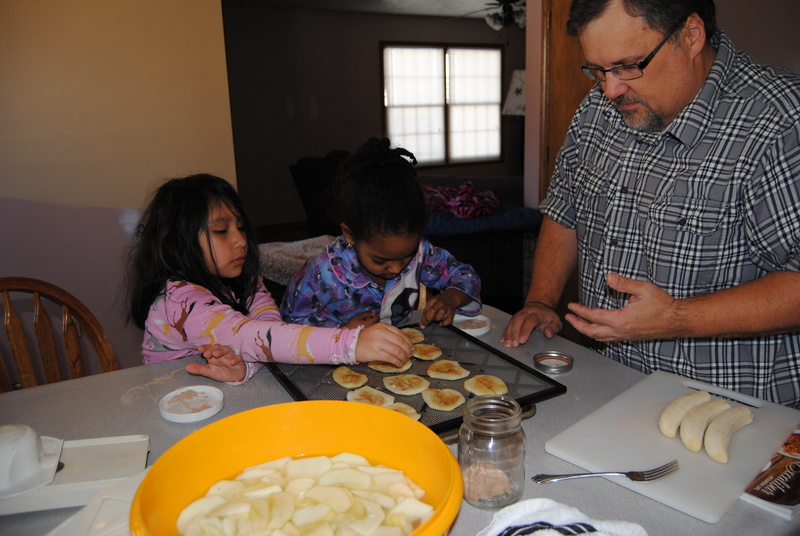 He then sliced them, soaked them, and had the girls put some cinnamon sugar on a few. Pay no attention to the partially painted wall. I was testing paint color by using up the excess paint from another room I had painted. I have decided I don’t like that color on that wall. While they were working, they talked about how nice it will be to one day have apples from our own apple trees. I concur! He also peeled, sliced and soaked bananas, placed on the fruit on trays and placed the trays into the dehydrator. For the rest of the morning into the afternoon, I listened to the hum of the dehydrator. This was hubby’s first time dehydrating fruit and like most things, it’s a learning process. But finally, the moment of truth . . . . the taste test. Before dinner the bananas had all been eaten and I’m not sure how many of the apple slices, if any, are left from the girls after dinner snack. Therefore, I would have to say it was a success and a nice way to spend a cold and snowy afternoon. Hubby’s first two experiments with his new dehydrator was beef jerky. Yesterday was the first time trying fruits. We’ll have to try cinnamon pears next time. Ooooh I recently bought a food dehydrator. So far, all I’ve made is beef and salmon jerky. I want to do some fruit, too, but I never manage to find the time. We love how the meat turns out, though, and while it’s in there cooking away for hours, our house smells like a BBQ restaurant. I’m definitely going to try some fruit. Hubby got a nice Excalibur dehydrator for Christmas. Growing and preserving our own food is the ultimate goal, so a good dehydrator was a must. His first two attempts were beef jerky. One turned out, one not so much (meat was sliced too thick). This was his third attempt and my house smelled like I was baking apple pies all day. Fewer calories with the same scents. Winner!